Note: this is the original discovery page from 1999. You can also go HERE for new images and news about Wolf-Rayet 104! The spiral is an ubiquitous shape in nature. Everyone is familiar with the spiral pattern of a sea shell, or the whirling flow of water as it goes down a drain, or the spiral shape of distant galaxies. Those who appreciate the beauty of these objects can add a new one to their lists: spirals around stars. Our team of Astronomers is happy to report the latest addition to the cosmic menagerie in a letter in the April 8, 1999 issue of Nature. This curious star, known as Wolf-Rayet 104, lies in the constellation of Sagittarius. Because it is so far from us, the apparent size of the spiral around the star is so small that its discovery relied on advanced imaging techniques that utilized the full resolving power of the Keck Telescope, the world's largest telescope. Wolf-Rayet stars, so named after the two astronomers who first discovered them, are hot massive luminous stars. They are typically 3 times the size and 25 times heavier than our sun, and would outshine it by a factor of 100000. This is the same ratio as the apparent brightness of our Sun compared to our Moon. At this level of brightness, the radiation field around the star takes on a life of its own, and plays a most unusual role: it drives off the outer atmosphere of the star by photon pressure. Thus Wolf-Rayet stars are so bright that they are literally flying apart! This results in a dense, high-velocity stellar wind surrounding the star that first attracted the attention of astronomers. 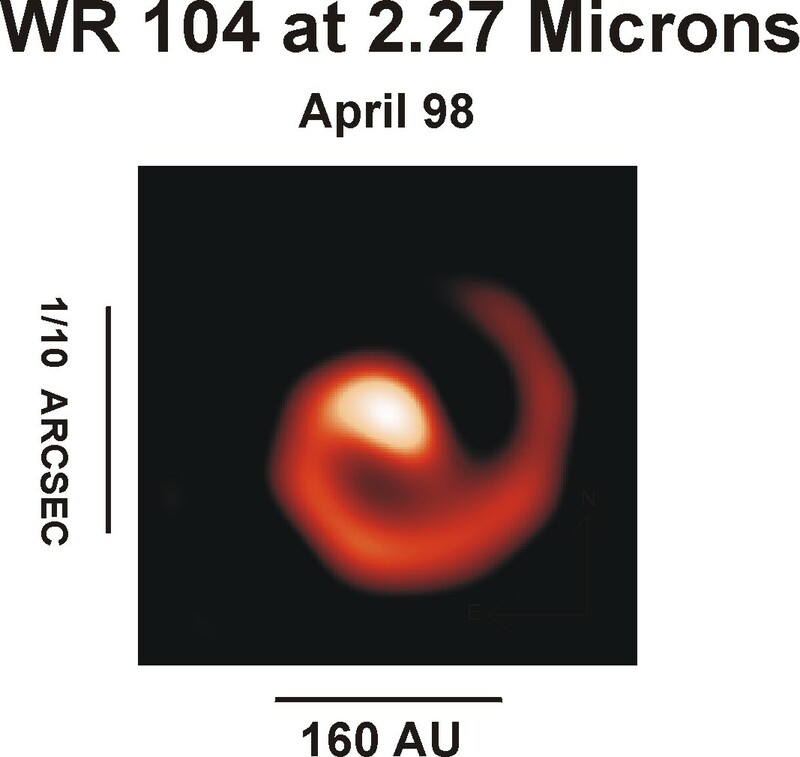 The image of WR 104 taken in April 1998 at the Keck I Telescope is shown here. A bar is drawn with a scale of 160 AU (or Astronomical Units), which is approximately the diameter of the spiral. This scale corresponds to twice the diameter of the orbit of Pluto around the Sun. One AU is equal to 93 million miles and is the distance from the Earth to the Sun. The image is so small it is equivalent to seeing details on the head of a pin at a distance of 2 miles. The image was reconstructed using the technique of aperture masking interferometry, in which most of the area of the Keck telescope was masked off, making it equivalent to 36 small circular regions or holes in which light could go through and interfere. Fringe patterns from the interference of these smaller "telescopes" are recorded with the facility near-infrared camera (NIRC) at the focus of the Keck I telescope and reconstructed into an image using software originally developed for radio interferometry. This technique is much less sensitive to atmospheric twinkling or seeing than direct imaging. This clarity of vision is the vital key to finding the spiral that was previously hidden from the eyes of astronomers by the shimmering of the earth's atmosphere. Without this technqiue we would have seen only a fuzzy blob many times larger than the images presented here. What is unusual about Wolf-Rayet 104 is that it is smoking like a chimney. The stellar wind is extremely dusty causing it to give off infra-red (or heat) radiation. This dust has been puzzling astronomers for many years. Although astronomers know that all the chemical ingredients to make dust are abundant in the stellar wind, the intense radiation from the Wolf-Rayet star should incinerate the dust as soon as it is born. Alternatively, when the wind is far enough away from the star to cool, the gas is now too thin for dust to condense. This catch-22 is the key to the puzzle. Can the snowflakes of dust somehow survive the furnace, or are they born in the wilderness? As the pictures on this page reveal, Wolf-Rayet 104 has a few more surprises in store. There must be another star lurking in the middle, making this a binary star system, and although the companion is not quite a twin brother to the Wolf-Rayet, it is nevertheless a luminous blue OB star with a strong stellar wind of its own. It would seem, from the point of view of a dust flake caught between the frying pan and the fire, that two hot stars are better than one. 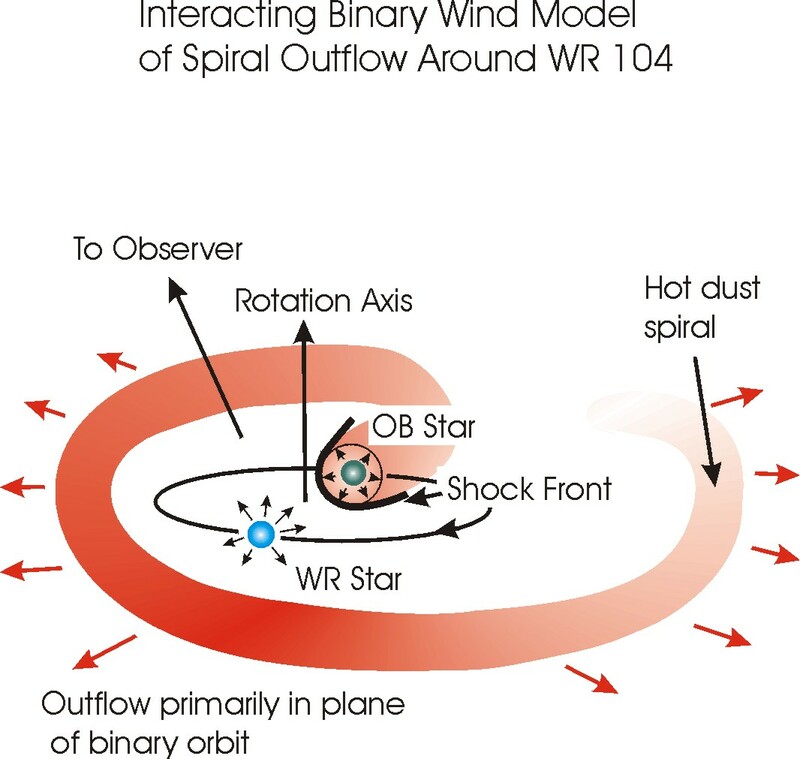 When the stellar wind from the OB companion meets the wind from the Wolf-Rayet star, a shock front forms which compresses the material from the stellar winds. It is in this "cocoon", where the density is high and the temperatures moderate that dust formation may flourish. 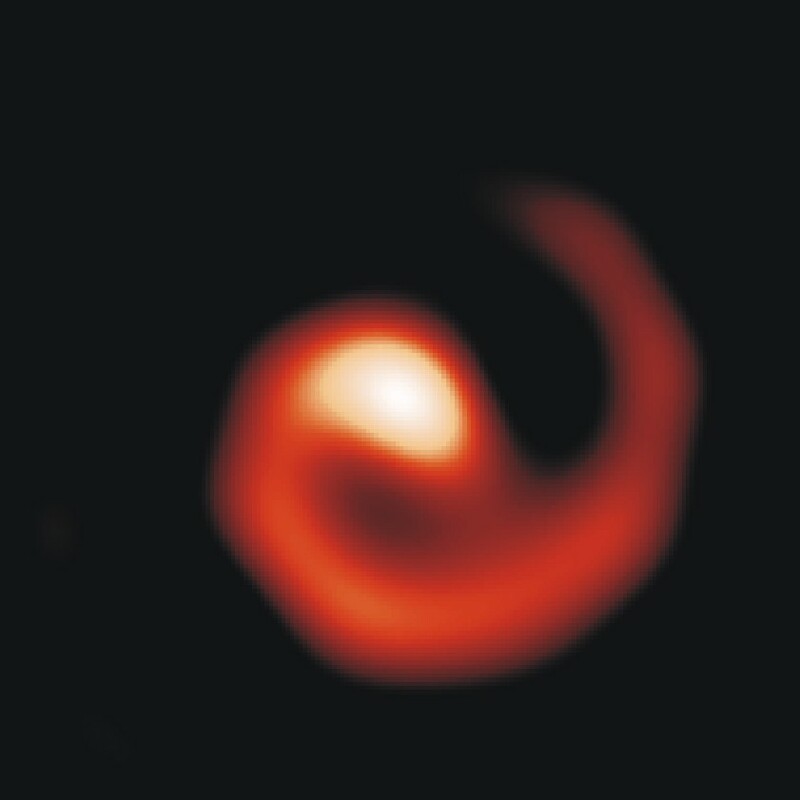 But why do our images of this star look like a spiral? Binary stars, like planets, are in constant motion. And so, our dust nursery at the collision front between the stellar winds, is carried around with the natural orbital motion of the companion OB star, doing a complete rotation once every 220 days. The spiral shape is a consequence of material being swept radially outwards by the stellar wind from this rotating dust formation zone. This is the classic "lawnsprinkler" spiral where the water is always flowing straight away from the center, but as the spigot rotates the water looks like it is flowing in a spiral when you look from the top. The cartoon shown above captures the essential features of this picture of WR 104. The movie images on this page are the first of a new type of stellar nebula: the spiral pinwheel. The first movie (on the left side) is made up of 3 time-lapse images from, April, June, and September 1998. It is a movie with only three frames, so its motion looks jumpy. The second movie (right) is made by "morphing" from image to the next in small steps so that the motion looks more continuous. From careful mathematical analysis of the images we determine many things about this unusual system, including the period of orbital motion, the inclination, the distance from Earth, and we can even start to make guesses about the star's life history. All from the dusty tail, without ever seeing the stars in the middle of it all! These results are further described in our letter in Nature "A dusty pinwheel nebula around the massive star wr 104" by Peter Tuthill, John Monnier and William Danchi Volume 398, pp. 487-489, April 8, 1999. Big gif of single frame of WR 104 (suitable for enlargement). Animated gif of 3 epochs of data on WR 104 (gif). Morphed gif of 3 epochs of data on WR 104 (gif). 3 epoch maps WR 104 (photoshop). WR 104 with title (jpg). WR 104 with no title (jpg). Schematic diagram of spiral (jpg).